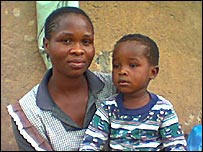 Photo: BBC Phindile is not sure if her son is also infected. Children with HIV and Aids in the developing world are half as likely as adults to get life-saving drugs. This means fewer than one in 10 of over two million children infected get anti-retroviral treatment (ARVs).